Before :- Altamas Kabir and J. Chelameswar, JJ. Civil Appeal No. 1191 of 2012 (arising out of SLP (C) No. 15174 of 2011). D/d. 31.1.2012. For the Petitioner :- Raj Kumar Mehta, Advocate. For the Respondent :- Debasis Misra, Advocate. J. Chelameswar, J. - Leave granted. 2. This appeal arises out of a judgment dated 18.2.2011 of the High Court of Orissa in Writ Appeal No. 114 of 2011. (A) Election to the post of Sarpanch of Kulagada Gram Panchayat in the District of Ganjam, Orissa were held in the year 2007. The appellant, the first respondent and two others filed their nominations. The scrutiny of the nominations took place on 16th January, 2007. The returning officer held all the four nominations valid. (B) Subsequently, except the appellant and the first respondent, the other two candidates withdrew from contest. Election took place on 17th February, 2007, wherein the appellant herein was declared elected. 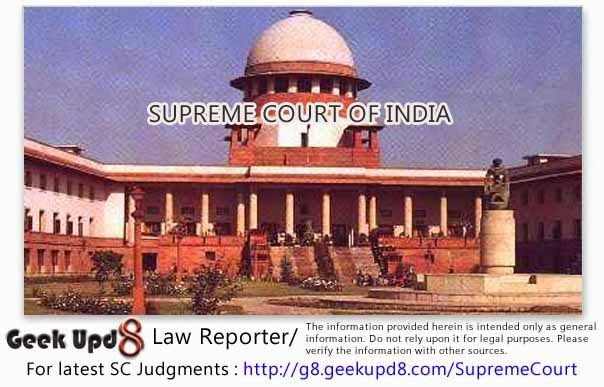 (C) The first respondent, filed an Election Petition under Section 31 read with Section 34 of the Gram Panchayat Act, 1964 (for the sake of convenience it is called "the Act"), on the ground that the appellant herein was not eligible to contest the election in view of Section 11(b) of the Act which declares that no member of 'Gram Sasan' (a defined expression under Section 2(h) of the Act 1) shall be eligible to contest for the post of Sarpanch if he has not attained the age of 21 years. It is the specific case of the first respondent that the appellant herein was born on 20.06.1986 and had not attained the age of 21 years by the relevant date. The 1st respondent, therefore, sought two reliefs in the election petition that the election of the appellant herein be set aside and also that the 1st respondent be declared to have been duly elected. The appellant contested the election petition. By the judgment dated 29.11.2008 the election petition was allowed. Aggrieved by the decision of the trial Court, the appellant herein carried the matter in an appeal under Section 38(4) of the Act to the District Court, Ganjam. The appeal was dismissed by a judgment dated 14th September, 2009. (D) Aggrieved by the same, the appellant herein carried the 1 "Gram Sasan" means a Grama Sasan established under Section 4'. matter by way of a Writ Petition (Civil) No. 14356 of 2009 to the High Court of Orissa which was also dismissed by a Judgment dated 18.2.2011, and the same was challenged in an Intra Court appeal in appeal No. 114 of 2011 without any success. By the Judgment under appeal, the writ appeal was dismissed. 4. It is argued by learned counsel for the appellant that the judgment under appeal cannot be sustained as there is no legally admissible evidence on record to enable the Courts below to reach the conclusion that the appellant was born on 20th June, 1986. "The trial court held that the date of birth of the petitioner was 20.6.1986 mainly on the basis of School Admission Register, Ext.5, the relevant entry of which is Ext.5/A, the Admission Form Ext.6 and the Transfer Certificate of the petitioner Ext.7, P.W.2, one Asst. Teacher of Basudev High School, Dhaugaon produced the School Admission Register and proved, it which was marked as Ext.5." 6. The question of admissibility of the exhibits 5, 5A and 7 was raised in the writ petition but rejected on the ground that the said documents were admitted in evidence without any objection before the Trial Court. However, the learned judge opined that mere proof of the above-mentioned exhibits does not mean that the content of the said exhibits was also proved. "Of course, only because those documents were admitted without objection, it cannot be said that the contents thereof were also admitted. It was the duty of the opp. party to prove the contents of those documents particularly, the date of birth of the petitioner entered in Ext.5 and the transfer certificate Ext.7." "In the present case the entry as per Ex.5/A was made on the basis of transfer certificate Ext.7 and the application made by Maheswar Gouda, cousin brother of petitioner's father. The trial court held that Maheswar Gouda, being the cousin brother of petitioner's father had special means of knowledge of the date of birth of the petitioner. Admittedly, said Maheswar Gouda has not been examined". 8. Unfortunately, the learned judge did not record any conclusive finding regarding the probative value of the contents of exhibits 5, 5A or exhibit 7, but went on to examine the evidence adduced by the appellant herein and found that the said material does not lend support to the case of the appellant herein and therefore the entry E.5/A made in Ext. 5 is true. A strange procedure indeed! Only matched by the strange decision of the appellant to adduce evidence. "But father of the petitioner has been examined as O.P.W. No. 3. As per the affidavit evidence the date of birth of the petitioner was incorrectly recorded in the school register and school certificate by the teachers, which appears improbable. Furthermore, it transpires from the evidence of the petitioner herself, that when she took admission in Panchayat U.P. School she was 10 years old. She took admission in the said school on 10.1.96. If 10 years is deducted from that date it would come to 9.7.1986. So, the evidence of the petitioner almost allies with the case of opp. party No. 1 that the date of birth of the petitioner was 20.6.1986." 9. Thereafter the learned judge elaborately discussed the evidence of the appellant herein and concluded that:- " It would not improve the case of the petitioner as discussed earlier". "The ground of attack of the impugned order is that the learned Single Judge having held that the documents relied upon by respondent No. 1, namely Exts.5,5/A and 7, which are the only documents from the side of respondent No. 1 to establish the date of birth of the appellant are not admissible in evidence under section 35 of the Evidence Act, the learned Single Judge erred in further probing into the matter and dismissing the writ petition. The aforesaid documents on the basis of which the respondent No. 1 sought to establish that the appellant was not qualified to file nomination having been found inadmissible, the only alternative was to allow the writ petition." 11. The Division Bench did not record any clear finding either on the admissibility or the probative value of the content of the above-mentioned exhibits but suddenly switched over to the examination of the evidence of the appellant. 12. Exts. A to H are documents produced by the appellant herein in support of her claim that her actual date of birth is 7.7.1985 but not 20.6.1986, as contended by the first respondent. Exts. A and H are voters lists of the year 2007 and 2008 respectively. The Division Bench observed that both the documents were prepared later in point of time to the filing of the nomination papers in the election in question and also they do not reflect the date of birth of the appellant herein. Similarly, Ext. D is a horoscope alleged to be that of the appellant herein. The Division Bench opined that the said document was rightly not relied upon. Ext. E is a certificate of date of birth issued under the provisions of the Registration of Births and Deaths Act showing the date of birth of the appellant as 7.7.1985 but such an entry came to be made pursuant to an application made by the appellant herein subsequent to the nominations in the election in question. The High Court refused to place any reliance on the said document on the ground that it was issued by an executive magistrate, who according to the High Court did not have the jurisdiction to issue the same. "........it was the duty of the opposite party (the first respondent herein) to prove the contents of those documents, particularly the date of birth of the petitioner (the appellant herein) entered in Ext.5 and the transfer certificate Ext.7"
"the evidence of the petitioner (the appellant herein) almost allies with the case of the opposite party No. 1 (the first respondent) that the date of birth of the petitioner was 20.6.1986." 14. We have already examined the evidence of the appellant herein. There is nothing in the said evidence to indicate that the date of birth of the appellant was 20th June, 1986. At the worst, the said evidence failed to establish that the appellant's date of birth was 7.7.1985. 15. The election of the appellant was challenged on the ground that the appellant was not eligible to contest the election on the ground that the appellant was not 21 years of age on the relevant date because according to the election petition, the appellant was born on 20.6.1986. The burden to proof the fact that the appellant was born on 20.6.1986 rests squarely on the first respondent. Section 101 of the Indian Evidence Act makes it abundantly clear. "S.101. Burden of proof - Whoever desires any Court to give judgment as to any legal right or liability dependent on the existence of facts which he asserts, must prove that those facts exists. When a person is bound to prove the existence of any fact, it is said that the burden of proof lies on that person." "To assert that a man who is alive was born requires no proof. The onus is not on the person making an assertion, because it is self-evident that he had been born. But to assert that he had been born on a certain date, if the date is material, requires proof; the onus is on the person making the assertion." Since the first respondent failed to discharge the burden cast upon him, the election petition must fail. ".........it transpires from the evidence of the petitioner herself, that when she took admission in Panchayat U.P. School she was 10 years old. She took admission in the said school on 10.1.96. If 10 years is deducted from that date it would come to 9.7.1986." "When I was five years of old, I joined in the school for the 1st time when I took admission in Dhougan U.P. school, I was ten yeas of old. I left that school in the year 1998. My father Apurba Gouda is an educated man. I can not recollect who had taken me to Dhougan School for admission. One outsider brought my T.C. from the Dhougan U.P. School and get me admitted in Dhougan High School. I cannot say his name. I was thirteen years of old, when I took admission in Dhougan High School in Class VIII." It can be seen from the above-extracted portion of the evidence of the appellant that the appellant stated that she was 13 year old when she took admission in the High School (obviously Basudev High School) and the admission, as we have already noticed from the evidence of PW.2, was on 11.7.1998. Deducting 13 years from that date would place the year of birth of the appellant in 1985. It is not clear as to the material on the basis of which the Division Bench recorded that the admission of the appellant in the Panchayat Upper Primary School was on 10.1.1996. We assume for the sake of argument that there is some basis on record for the finding that the appellant took admission in the Upper Primary School on 10.1.1996. On her own admission she was 10 years old on that date. Then there is an inconsistency in her evidence regarding her age with reference to her admission into the Upper Primary School and Basudev High School. In such a case, her statement that she was 10 year old on 10.1.1996, in our opinion, cannot be treated as an admission that her date of birth is 20th June, 1986. An admission must be clear and unambiguous in order that such an admission should relieve the opponent of the burden of proof of the fact said to have been admitted. 19. For all the above mentioned reasons, we are of the opinion that the judgment under appeal cannot be sustained and the same is set aside. In view of our conclusion, the second question regarding the declaration in favour of the first respondent does not survive.